Two Fridays in the Philippines down, one to go! Since I last checked in, I returned from Bohol via ferry, flew into Dipolog, and flew back to Cebu. All in the past two days! 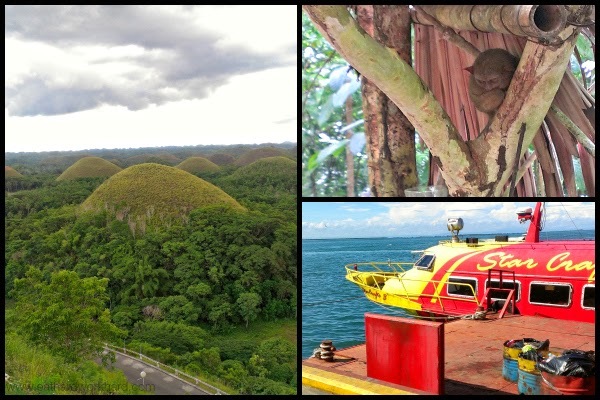 I did get to see some cool things in Bohol on my way back to the ferry, though, including the famous chocolate hills and creepy looking tiny monkey tarsiers. I'm joining the Friday Five Linkup with Eat Pray Run DC, Mar on the Run and You Signed Up for What?! and am outsourcing my blog topic creativity again by following this week's theme. A lot of my friends and family ask me why I spend so much time working out during travel. The truth is that I don't spend that much time exercising (definitely spend way more time eating), but the time that I do spend is well worth it. So for today's Friday Five, here are five reasons to exercise while traveling. 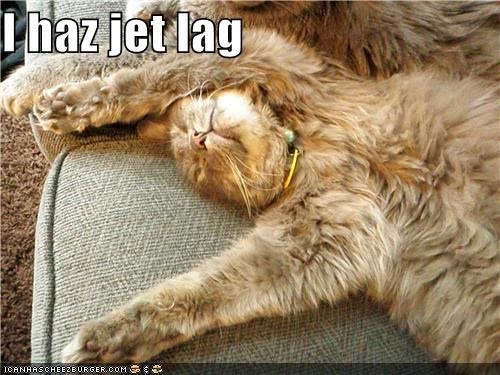 If you've ever flown between time zones you know that jet lag is the worst. Because of science, exercising regularly before and during your trip can help lessen the effects of jet lag! Plus, it's a lot better for you than my usual method of downing as many cups of Nescafé as I can find. As you probably know, eating is one of my favorite parts of traveling. And while I'm all about enjoying delicious foods I can't get anywhere else, working out helps me to not feel terrible about (sometimes over) indulging. I don't know about you but my work travel is super demanding, and even vacations can be stressful. Spending hours on planes, trains, boats and buses, sleeping in strange beds, and other major departures from your normal routine can be taxing on your body. Maintaining some kind of exercise schedule helps bring a sense of normalcy. Plus, exercise gives you endorphins which can prevent you from killing your husband/the front desk clerk who lost your reservation. Also because of science, even low-intensity exercise can help you feel more energized, letting you get more meetings/sight seeing/beach lying done. Coming back from travel is hard. Going back to work, getting back to a healthy eating routine, and readjusting your sleep schedule all at the same time isn't easy. Restarting a fitness routine can be particularly difficult, and if you're like me it's really easy to keep putting it off. Getting back to regular exercise is much easier if you never completely stopped in the first place. Q: Do you make it a point to fit in exercise while traveling? What's the most Nescafé you've had and still lived to tell the tale? Yes ALWAYS. Whenever we go anywhere I always like to check out the gym situation or plan out routes where I can run. I would probably come back with zero motivation if I ever stopped! I don't think I've ever had Nescafé. My mom used to drink it all the time though! I dont as often as I should, but I need to. Good reminders for why to keep it up instead of "take it easy". Thanks John! Even a little bit helps! Also I've been MIA in the blogworld because of my move but I LOVE your blog makeover!! Thanks Lindsay! Totally understandable--moves are so stressful. Good luck with yours! Ooh nice! I don't run outside a lot of places I travel because of pollution and cultural norms but that's a really great idea! Great post :) I always try to make sure I stay active on vacation, even if it's not "working out." I love to go hiking on vacation and always lots of walking. Our last trip to California ended up with us walking more than 10 miles per according tomy fitbit. Love walking on vacation too! Great way to stay active. 10 miles is a ton, great job! I always go for a run on vacay. I love seeing new places, and what better way to do it?! Don't hurt me, but...what is Nescafe? Is it hot chocolate? I always scope out the gym and any classes around our hotels. Husband thinks I'm nuts but a girl's gotta get her workouts in right?! Thanks Courtney! I love seeing your on the go workouts too! I absolutely make it a point to work out when I travel!!! and chances are if I'm traveling, I'm running a race anyway, lol. I always make a point to exercise when I travel. I try to make use of all the great gym equipment at the hotels and keep my digestive system working well...eating differently throws everything off! In January I went to Ecuador, and I had about 3x more caffeine per day than I normally do (and normally I only have it 3-4x/week, and there I had it every day for about 8 days)- I came home addicted and had a rough next week trying to get myself back to normal :) I love the reasons why you keep exercising. On longer trips (more than a week), I generally just enjoy walking around new cities, and count that as my exercise. Longer trips and I'll try to adjust things here and there to get in other work outs. Oh, definitely relate with #5 the most - it's so easy for my mind to justify not working out and then keep justifying it, so I need to try to keep a consistent schedule or as consistent as I can so that if I do miss a day or two, it's not hard to jump back on. Yea agree consistency is definitely key! I was doing the Runner's World Running Streak on my vacation last summer, and I thought I would fail miserably, but I ended up LOVING it! It was nice to get to start the day with a little sweat and I got to explore a little extra each day. It didn't hurt that it was low 70s and by the water either :-) I hope you're having a great time on your trip! Ooh sounds like beautiful running weather, I'm jealous! It's pretty here but it's like 90+ degrees and 90% humidity lol. Thanks Lindsey! Absolutely. We always make time for exercise when we travel. In fact, if we are on vacation, we make MORE time for it, lol. Does that make us weird?! Exercise is quite essential for every human being and therefore, we should follow a strict exercise plan in our lifestyle so that we can easily maintain a good physical fitness. Doesn't matter wherever we are we need some exercise to maintain our physical fitness, whether we are traveling, we are on holiday and others. Here also we have found that why we need exercise while traveling. Instead of taking gym products with us, we should follow some essential instructions from here to stay fit and active.